When British and European Union (EU) negotiators announced on Thursday that they had reached agreement on a draft text for a Brexit deal, it was unquestionably a breakthrough in the protracted and difficult negotiations. Even as he spoke, the deal’s critics were growing louder. Five cabinet officials—Brexit Secretary Dominic Raab, Junior Brexit Minister Suella Braverman, Junior Northern Ireland Minister Shailesh Vara, Work and Pensions Secretary Esther McVey and Minister of Transport Jo Johnson—resigned within a day. The pound plunged nearly 2%. Ireland lies at the heart of Brexit’s insurmountable problem because Britain has conflicting, mutually exclusive desires. In sum: Northern Ireland (NI) is politically part of the UK, but physically occupies a sixth of the island of Ireland. The bulk of the island is the Republic of Ireland, which is politically part of the EU. Exiting the EU’s customs union requires creating a border between the UK and the EU, and thus a border somewhere around NI—either on land, between the Irish Republic and NI, or at sea, between NI and the rest of the UK. Neither is acceptable to Britain. Going borderless is unacceptable to the EU. Source: Ireland's Industrial Development Authority. IDA’s contingency planning has proceeded on the assumption of a ‘hard Brexit,’ Donoghue said. Such a Brexit would mean the return of a hard border between Ireland and Northern Ireland and end the free movement of people, goods, services, and capital between them. 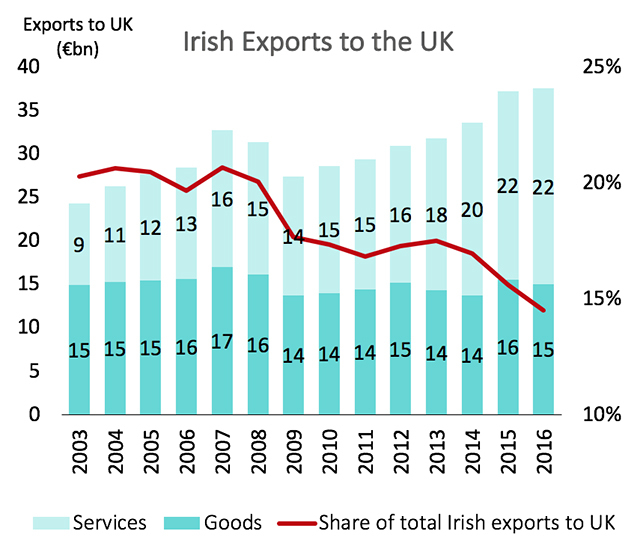 This disruption would put the €22 billion in Irish services exported to the UK in 2016 at risk because the cost of doing business would jump dramatically, damaging trade and investment flows and ultimately employment. The IDA estimates that Ireland would lose 40,000 jobs and its GDP growth would take a 3.7% hit in the event that a hard border with NI is created. Even in IDA’s best-case scenario (a so-called “soft Brexit”), the spike in foreign direct investment caused by companies seeking an attractive alternative to doing EU-related business in the UK is unlikely to offset the job losses. As it stands now, there are over 40 Brexit-related investments in Ireland across all business sectors. Although the country’s regulatory maturity in certain financial niches might not equal that of Paris or Frankfurt, the advantages it offers—a highly educated English-speaking workforce, business-friendly government and geographic proximity to the UK, which will remain one of the most important markets in Europe even after Brexit—give it an edge. Without a large domestic market to offer prospective businesses—less than 5 million people live in Ireland—successive governments enticed multinationals with a generous tax regime. This gamble paid off as many financial service companies domiciled back and middle-office functions in Ireland over the past three decades. Brexit is an opportunity for Ireland to double-down on this strategy and scale up its presence and sophistication in the financial services sector by making targeted bids for more complex, high end activities such as derivatives trading previously done in the City of London. Already, Ireland has received Brexit-driven investment from such marquee names as J.P. Morgan, Citi, Barclay’s, TD Bank and S&P Global. Even Chaucer is leaving England—Chaucer Insurance, that is.